This year has certainly been a bumper year for Cthulhu Reborn, at least in terms of releasing new Lovecraftian PDFs to shock, horrify (and we hope delight) your RPG gaming group. So, it only seems fitting to close out 2017 by releasing one final PDF — our Christmas gift to gamers everywhere. 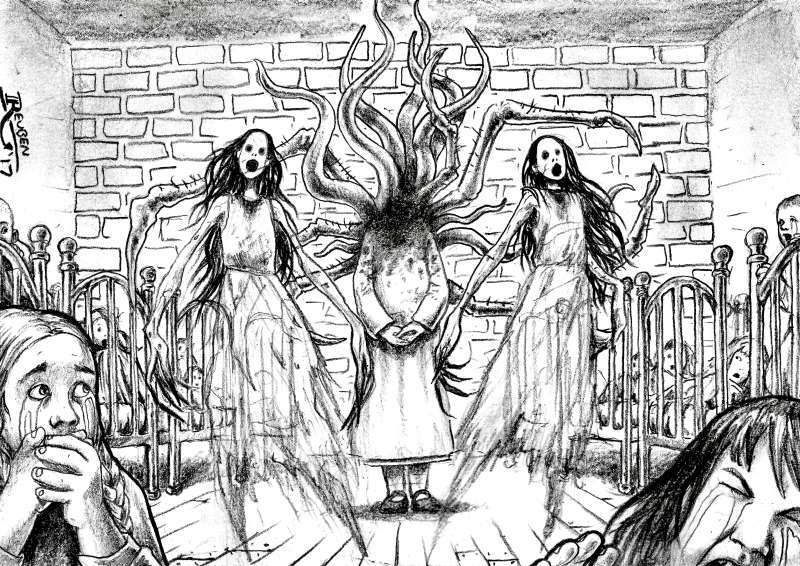 With today’s release of Ticket of Leave #9: Orphan School Horror we have done just that. This 23-page PDF is available for download right now, absolutely for free. This release also brings up a small milestone for the Convicts & Cthulhu product line, being our 10th C&C release! We’re also particularly proud of the fact that this is our largest scenario seed release to date (and arguably, the scenario that is most easily transplanted to other historical — or even more contemporary — settings). So even if you have absolutely no interest in the C&C setting, this PDF may have something of interest. As with previous Tickets of Leave, ToL#9 aims to explore a previously glossed aspect of the colonial Australian setting — this time, the perilous plight of children in the penal settlements. It’s easy to imagine that a place set up as a full-time prison, thousands of miles from Britain, would have had no children whatsoever. But that was very far from the truth. Some children were sent to the colonies as convicts themselves, but many more accompanied mothers who had been convicted of crime. Quite a number of children were even born during the long (and rather horrific) journeys which brought their mothers out to Australia. And when the convict colonies became more established, many many children were born as the products of liaisons between convicts or between convicts and gaolers. Even aside from the fact that the prison colonies were a rather unwholesome place for children, the presence of such a vast number of (mostly illegitimate) children created more than a few problems. Most disturbing of these was the rise of an underclass of destitute children, boys and girls whose convict parents simply could not afford (or in many cases want) to raise them. These unfortunate children lived mostly on the streets … at least until a few “benevolent” institutions were founded to protect destitute children from being preyed upon. In the Convicts & Cthulhu era the only real facilities of this type were the Female Orphan Schools at Sydney and (later) Parramatta. This Ticket of Leave includes historical information about the Sydney Female Orphan School. It also includes a mountain of information about using this intriguing historical institution as the setting for tales of personal-level horror, riffing on the familiar theme of orphanages as places of horror fuelled by the misfortune and suffering of young innocents. If you don’t know the type of horror tale we’re talking about, grab yourself a copy of the amazing 2007 Spanish horror firm “El Orfanato” (aka “The Orphanage”) and you will soon see the story potential such places offer. We’ve saved this particular Ticket of Leave until Christmas since … well … tales of spectral horrors haunting drafty orphanages seems to tick a lot of the boxes that people have come to expect from horrific tales at Christmas. Having said that, there’s really nothing that would stop you from setting the detailed scenario seed incorporated in Ticket of Leave #9 at any time of calendar year. But if you particularly want to gather your gaming group for an evening of egg-nog, mistletoe, and creepy extra-dimensional horrors thirsting for the downfall of humanity — well, this is the scenario for you! As usual with the scenario portions of our Ticket of Leave releases this seed sets up a complex, investigation-based scenario premise and then provides the Keeper with three different Cthulhu Mythos forces that may be responsible. This time around, Geoff Gillan has been particularly inventive with his talented weaving of the themes common to dark tales told around the Christmas fireplace, with the dark visions of H.P. Lovecraft and a couple of other similarly-minded authors. 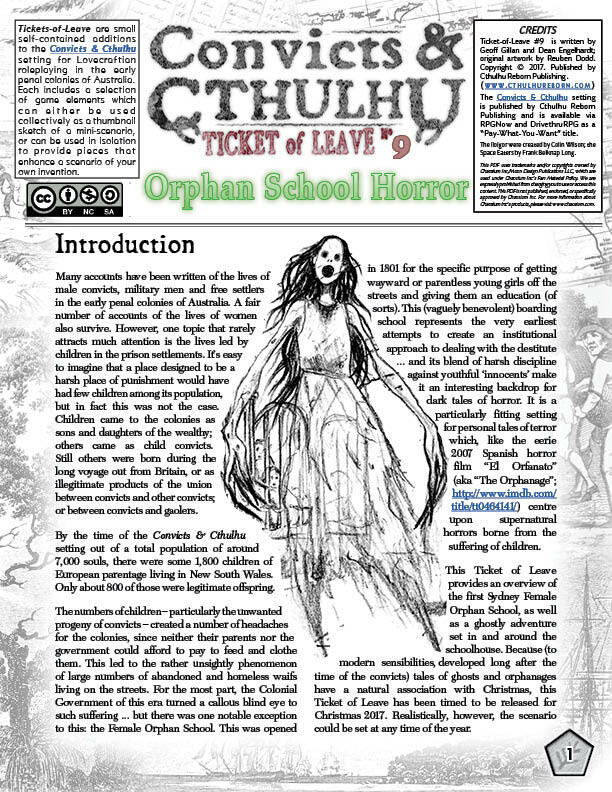 Ticket of Leave #9: Orphan School Horror is available right now for free download from the Cthulhu Reborn blog, complete with game statistics for Call of Cthulhu 7th Edition (under Chaosium’s fan license). For complicated reasons associated with Intellectual Property restrictions imposed by Chaosium, we’ve also created a stat-free version released via DrivethruRPG — in all likelihood, if you’re reading this post, you’ll probably want the version with all the game stats. We hope you and your group enjoy some wonderful Christmas horrors! And, if you have supported Cthulhu Reborn throughout 2017 (as many readers have done), please accept our heartfelt thanks and appreciation! It’s feedback and support from the community that keeps us going. This entry was posted on Monday, December 18th, 2017 at 3:26 am	and posted in Convicts & Cthulhu, Scenario Downloads. You can follow any responses to this entry through the RSS 2.0 feed.